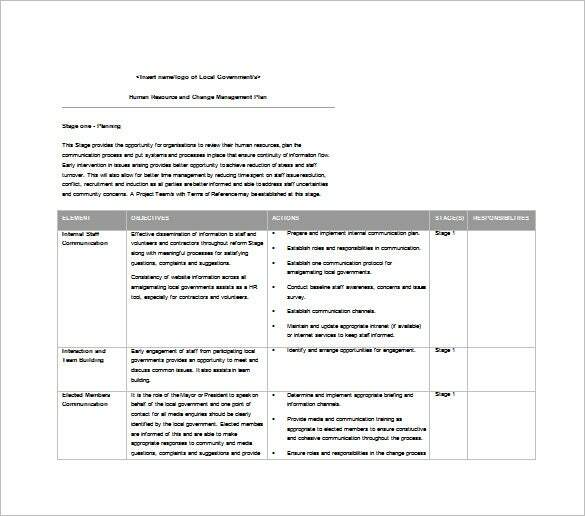 11+ Change Management Plan Templates – Free Sample, Example, Format Download! 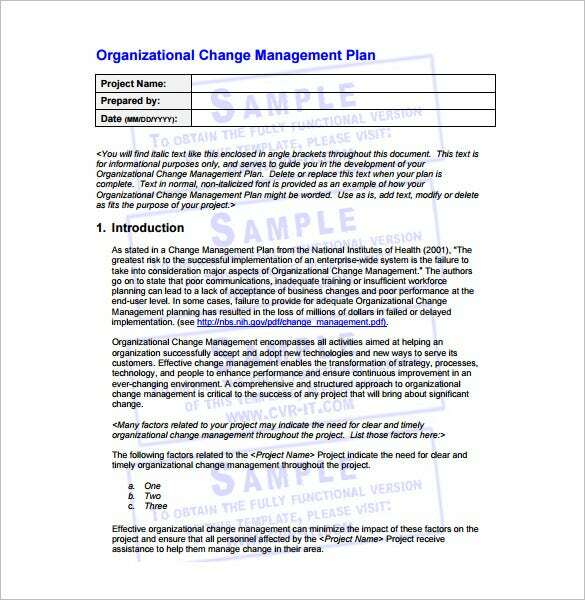 Change Management Plan Template or a Transition Plan Templates can help you create strategies for managing change. Obviously, for you to succeed in business, you need a change management plan. 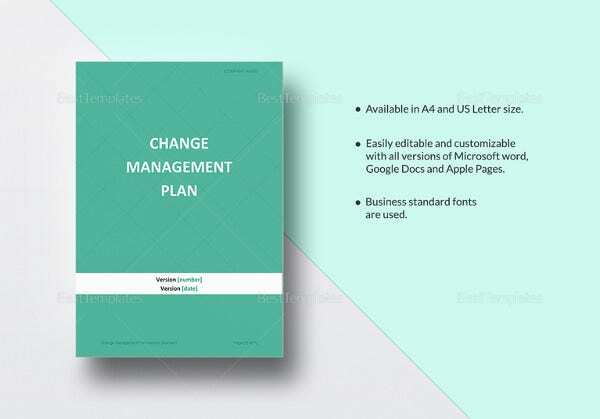 This plan defines all your roles in managing and controlling change during the control and execution stage of your plan. As an entrepreneur, you should always measure change against your project baseline, which covers the budget scope, quality management plans, change, risks and schedule. In the business world, people witness changes mostly during the execution and control stage. The changes in this stage require one or several revised project baselines. 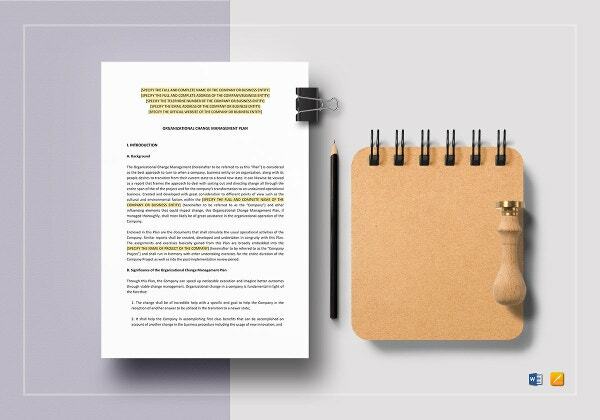 Even though changes can occur in any stage of a business lifecycle, controlling them in this stage will help you avoid overrun in schedule, poor quality, incoherent scope and costs. 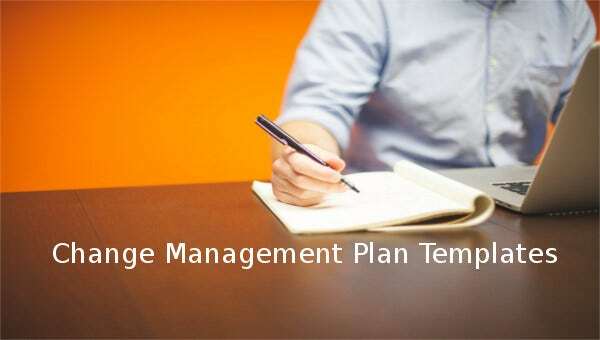 When making a change management plan, involve your project team, the project manager, customers and the project sponsors. You may also like Plan Templates. 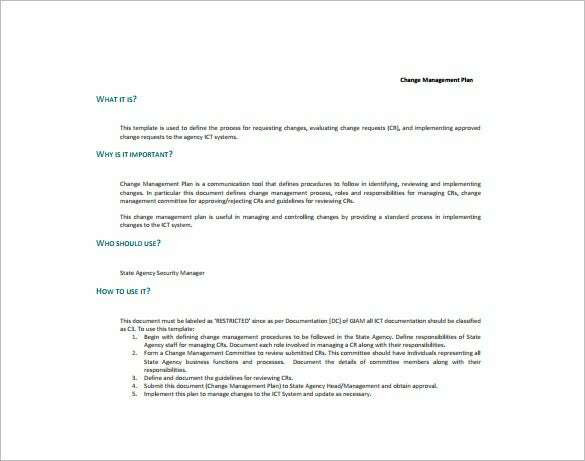 vbhconsulting.com | Scope Change Management Plan is a Free, easy to use Word template which provides guidelines for the project team and Project Manager to manage the changes that occur on the project. 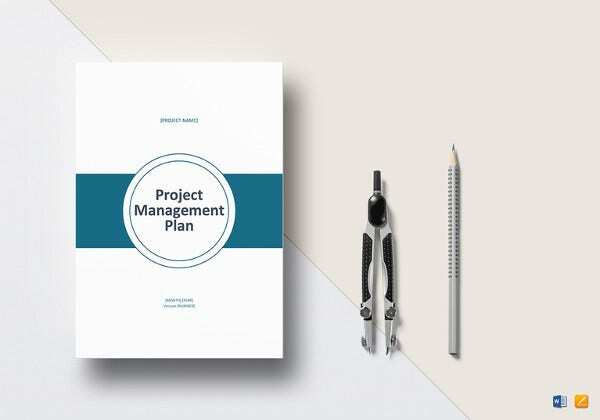 Establishing processes for managing change during the project planning phase provides better control during the execution phase of the project. 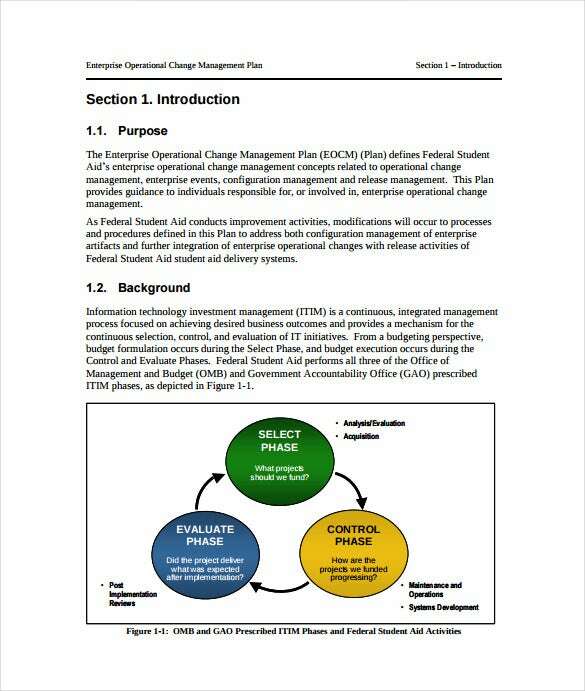 studentaid.ed.gov | Enterprise Operational Change Management Plan Sample is a free, user friendly, ready to use PDF Template which defines enterprise operational change management concepts which are related to operational change management, enterprise events, configuration management and release management. 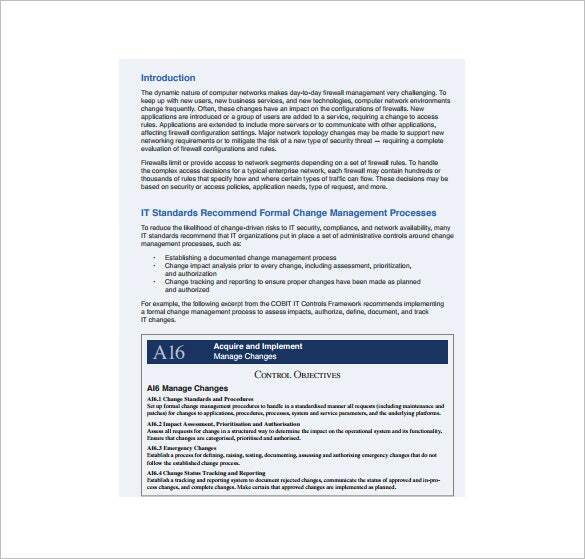 This Plan template provides guidance to individuals responsible for, or involved in, enterprise operational change management. 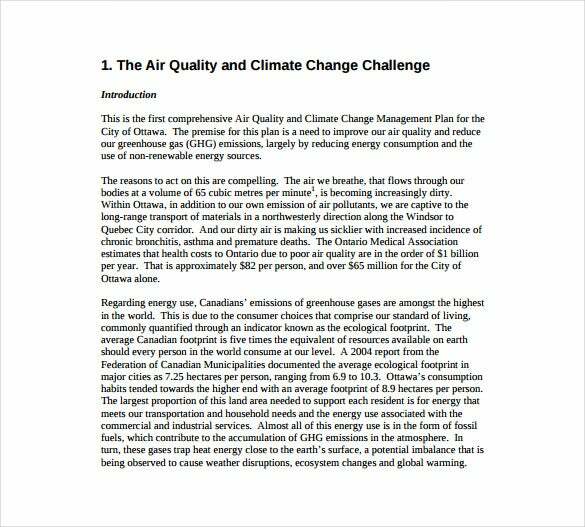 ottawa.ca | Air Quality and Climate Change Management Plan Example Template provides a context for climate change and air quality issues within the City, proposes Corporate or Community target for greenhouse gas emission reduction and outlines the measures the City should undertake to reach this target. Implementation of the measures in the Plan will help us to reach our goal. 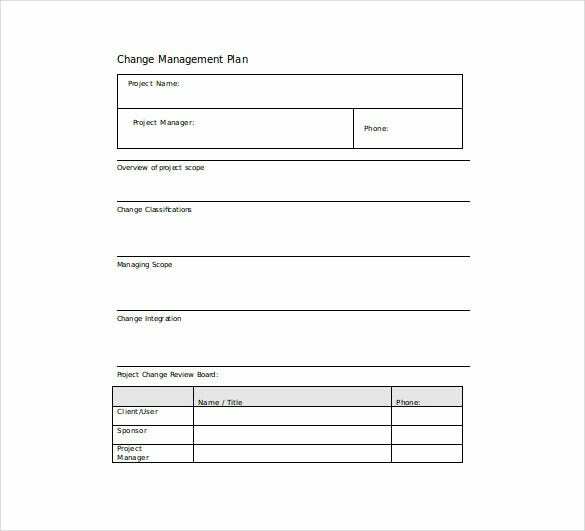 qcert.org | GIAP Change Management Plan Sample is a free PDF Template which is used to define the process for evaluating change requests (CR), requesting changes, and implementing approved change requests to the agency ICT systems. 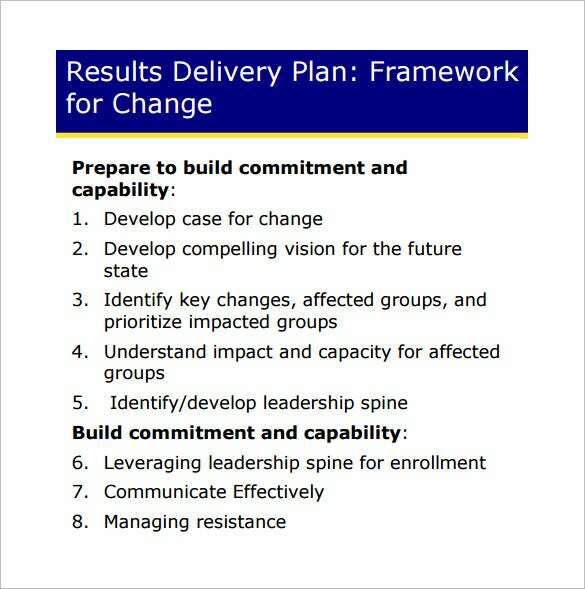 Our plan template is a communication tool that defines procedures to follow in identifying, reviewing and implementing changes. westcon.com | This is the Firewall Change Management is a Free PDF template and it has been designed and developed specifically to shield your systems and network against IT-security hazards and risks. The template comes with a set of administrative controls which take care of the management processes. And prior to authorizing any changes, it makes sure to assess and prioritize.